Chikungunya is a mosquito-borne viral disease that is transmitted from human to human by the bites of infected female mosquitoes. Most commonly, the mosquitoes involved are Aedes aegypti and Aedes albopictus, two species which can also transmit other mosquito-borne viruses, including dengue. These mosquitoes can be found biting throughout daylight hours, although there may be peaks of activity in the early morning and late afternoon. After the bite of an infected mosquito, onset of illness occurs usually between 4 and 8 days but can range from 2 to 12 days. It is characterized by an abrupt onset of fever frequently accompanied by joint pain. Other common signs and symptoms include muscle pain, headache, nausea, fatigue and rash. The joint pain is often very debilitating, but usually ends within a few days or weeks. Most patients recover fully, but in some cases joint pain may persist for several months, or even years. Occasional cases of eye, neurological and heart complications have been reported, as well as gastrointestinal complaints. If chikungunya cases are confirmed, the treatment is to mitigate pain and fever using anti-inflammatory drugs along with rest. Persistent joint pain may require analgesic and long-term anti-inflammatory therapy. Prevention is entirely dependent upon taking steps to avoid mosquito bites and elimination of mosquito breeding sites. On 28 May 2016, the Ministry of Health of Kenya notified WHO of an outbreak of Chikungunya in Mandera East sub-county. The first reports of an increase in cases with febrile illness and joint pains occurred in May 2016. Samples were collected and shipped to the Kenya Medical Research Institute (KEMRI) Arboviral Laboratory in Nairobi. On 16 May, KEMRI laboratory confirmed 7 of the 10 samples tested positive for Chikungunya virus. All samples tested negative for other arboviruses including: dengue, yellow fever and West Nile viruses. As of 30 June 2016, 1,792 cases had been line listed. No deaths have been reported so far. However there is a risk of underreporting of cases since many patients are not reporting to health facilities. There have been outbreaks of Chikungunya in neighbouring Bula Hawa region in Somalia border region originating from Mogadishu. It is estimated that about 80% of the population and 50% of the health work force in Mandera town were affected by Chikungunya. Cases with severe debilitating joint pains were being managed as inpatients for a short duration for 1 or 2 days. However, the majority of the cases are not seeking treatment in health facilities. On 9 September 2015, the Ministry of Health and Social Affairs (MOHSA) of Senegal notified WHO of active circulation of chikungunya virus in the region of Kédougou. The circulation began on 27 August 2015. Samples were collected from 14 suspected cases for laboratory-confirmation at the Institut Pasteur of Dakar. Ten (10) samples tested positive for chikungunya virus. As of 8 September 2015, ten (10) chikungunya confirmed cases were reported. The latest active circulation in the affected area was reported between 2009 and 2010. 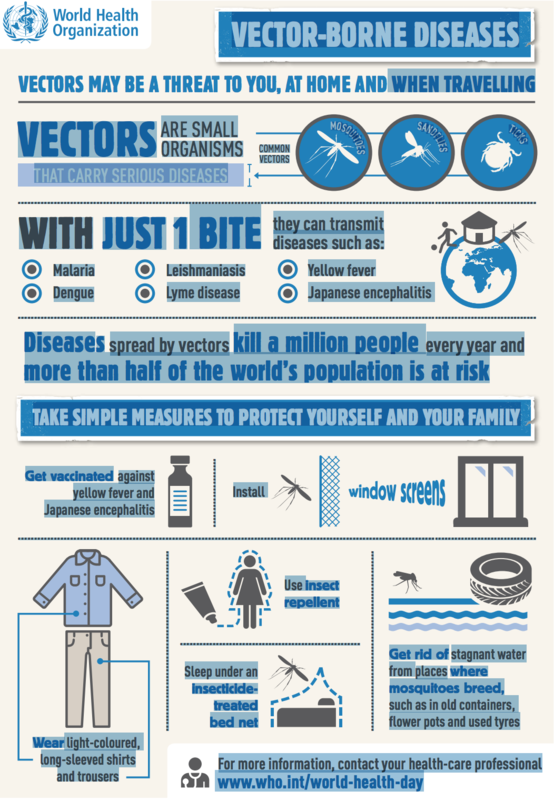 The infographic "Vector-borne diseases", created for World Health Day 2014, highlights a number of measures people can take to protect themselves from vector-borne diseases. The proximity of mosquito breeding sites to human habitation is a significant risk factor for chiÍkungunya. The disease occurs in Africa, Asia and the Indian subcontinent. In recent decades mosquito vectors of chikungunya have spread to Europe and the Americas. In 2007, disease transmission was reported for the first time in a localized outbreak in north-eastern Italy. Outbreaks have since been recorded in France and Croatia. Chikungunya occurs in Africa, Asia and the Indian subcontinent. Human infections in Africa have been at relatively low levels for a number of years, but in 1999–2000 there was a large outbreak in the Democratic Republic of the Congo, and in 2007 there was an outbreak in Gabon. Starting in February 2005, a major outbreak of chikungunya occurred in islands of the Indian Ocean. A large number of imported cases in Europe were associated with this outbreak, mostly in 2006 when the Indian Ocean epidemic was at its peak. A large outbreak of chikungunya in India occurred in 2006 and 2007. Several other countries in South-East Asia were also affected. Since 2005, India, Indonesia, Maldives, Myanmar and Thailand have reported over 1.9 million cases. In 2007 transmission was reported for the first time in Europe, in a localized outbreak in north-eastern Italy. There were 197 cases recorded during this outbreak and it confirmed that mosquito-borne outbreaks by Ae. Albopictus are plausible in Europe. In December 2013, France reported 2 laboratory-confirmed autochthonous cases in the French part of the Caribbean island of St Martin. Since then, local transmission has been confirmed in over 43 countries and territories in the WHO Region of the Americas. This is the first documented outbreak of chikungunya with autochthonous transmission in the Americas. As of April 2015, over 1 379 788 suspected cases of Chikungunya have been recorded in the Caribbean islands, Latin American countries, and the United States of America. 191 deaths have also been attributed to this disease during the same period. Canada, Mexico and USA have also recorded imported cases. On 21 October 2014, France confirmed 4 cases of locally-acquired chikungunya infection in Montpellier, France. In late 2014, outbreaks were reported in the Pacific islands. Currently chikungunya outbreak is ongoing in Cook Islands and Marshall Islands, while the number of cases in American Samoa, French Polynesia, Kiribati and Samoa has reduced. WHO responded to small outbreaks of chikungunya in late 2015 in the city of Dakar, Senegal, and the state of Punjab, India. In the Americas in 2015, 693 489 suspected cases and 37480 confirmed cases of chikungunya were reportedto the Pan American Health Organization (PAHO) regional office, of which Colombia bore the biggest burden with 356 079 suspected cases. This was less than in 2014 when more than 1 million suspected cases were reported in the same region. In 2016 there was a total of 349 936 suspected and 146 914 laboratory confirmed cases reported to the PAHO regional office, half the burden compared to the previous year. Countries reporting most cases were Brazil (265 000 suspected cases), Bolivia and Colombia (19 000 suspected cases, respectively). 2016 is the first time that autochthonous transmission of chikungunya was reported in Argentina following an outbreak of more than 1 000 suspected cases. In the African region, Kenya reported an outbreak of chikungunya resulting in more than 1 700 suspected cases. In 2017, Pakistan continues to respond to an outbreak which started in 2016. Both Ae. aegypti and Ae. albopictus have been implicated in large outbreaks of chikungunya. Whereas Ae. aegypti is confined within the tropics and sub-tropics, Ae. albopictus also occurs in temperate and even cold temperate regions. In recent decades Ae. albopictus has spread from Asia to become established in areas of Africa, Europe and the Americas. The species Ae. albopictus thrives in a wider range of water-filled breeding sites than Ae. aegypti, including coconut husks, cocoa pods, bamboo stumps, tree holes and rock pools, in addition to artificial containers such as vehicle tyres and saucers beneath plant pots. This diversity of habitats explains the abundance of Ae. albopictus in rural as well as peri-urban areas and shady city parks. Ae. aegypti is more closely associated with human habitation and uses indoor breeding sites, including flower vases, water storage vessels and concrete water tanks in bathrooms, as well as the same artificial outdoor habitats as Ae. albopictus. In Africa several other mosquito vectors have been implicated in disease transmission, including species of the A. furcifer-taylori group and A. luteocephalus. There is evidence that some animals, including non-primates, rodents, birds and small mammals, may act as reservoirs. publishing guidelines and handbooks on case management and vector control for Member States. WHO encourages countries to develop and maintain the capacity to detect and confirm cases, manage patients and implement social communication strategies to reduce the presence of the mosquito vectors.